Nestled alongside the sparkling Pacific Ocean, this gorgeous resort spans eight sun-drenched acres of beachfront paradise. This Mexican hacienda-style resort is just moments from the marina and downtown Cabo's vibrant shopping, dining and nightlife. After a day of exploring and outdoor adventures, relax in a luxurious suite featuring a kitchenette, balcony, and Jacuzzi bathtub. Enjoy ocean view dining, a private beach, an oceanfront spa, or lounge by the infinity pools. 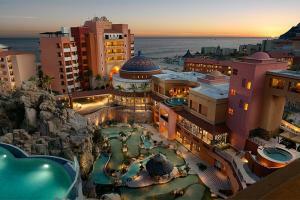 Located in Cabo San Lucas, just steps from Land's End on the Baja Peninsula.